"How solemn it is out there under God's heaven with the lily and the bird, and why? Ask the poet. He answers: Because there is silence. And his longing goes out to that solemn silence, away from the worldliness in the human world, where there is so much talking, away from all the worldly human life that only in a sad way demonstrates that speech distinguishes human beings above the animals. 'Because,' says the poet, 'if this is the distinguishing characteristic - no, then I much, much prefer the silence out there.'" - Soren Kierkegaards, The Lily in the Field and the Bird of the Air. Let me just say first that this is not really a book review - it's more of a little hat-tip to an author, George Prochnik, from a girl with a crush on quiet places and a tendency towards stress-induced sensory processing disorder . 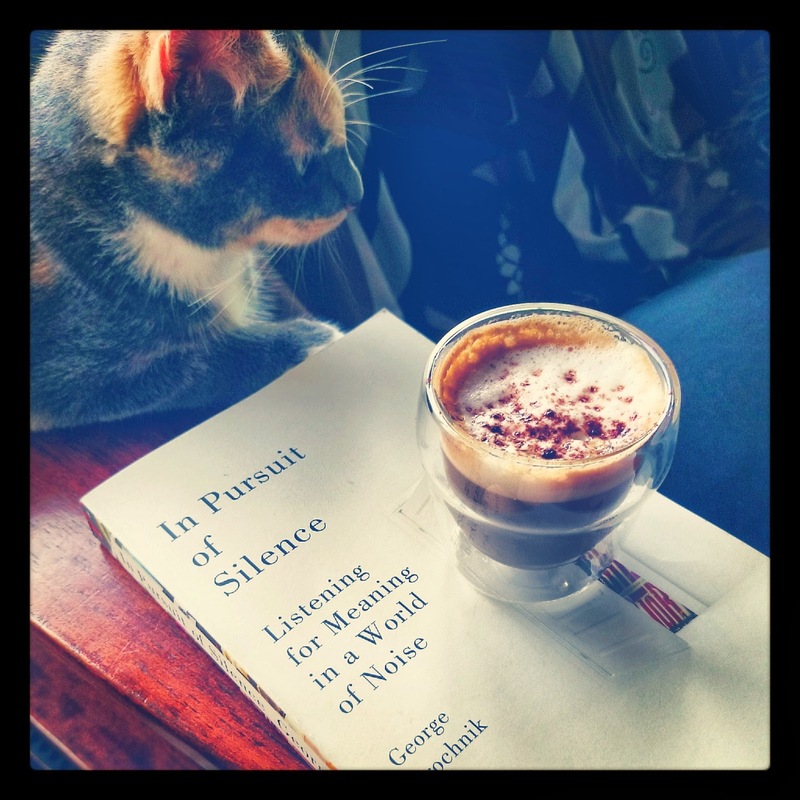 I have just finished reading Prochnik's book, 'In Pursuit of Silence: Listening for Meaning in a World of Noise'. Not only was this scientific yet philosophical book enjoyable, it also profoundly changed the way I take note of the sonic world around me. Big call, yes - but I've noticed in the weeks since I finished this intriguing story that I'm much more aware of individual sounds around me. And surprisingly, rather than being overwhelmed by this sudden sharp focus on the sheer number of sounds I'm aware of, I've been able to let them (mostly) wash over me without them affecting my mood, in a very zen way. Note too, this is no mean feat; my street borders a major industrial area filled with the likes of supermarket distribution centres operating round the clock, international freight carriers, heavy industrial manufacturers, and all sorts of other lovely neighbors. It wasn't like this when we moved here, but the trucks compression-braking down the hill long into the night are now a part of our lives. I find low road noise comforting; growing up in a house backing onto the Great Western Highway was my first introduction to how low-level white noise could shunt me gently into the land of nod. But a low rumble does not compare with staccato forklift reversing beeps, the intrusive bone-shaking brakes of those trucks, and the insistent and constant road noise echo that floats down into our windows from the pockmarked road surface itself. "For all of us, the effect of sound we can't get away from can be literally dizzying. When it is loud enough it can disturb the vestibular system in the inner ear on which our sense of equilibrium depends. Even when not actually inducing vertigo, there's a loss of psychological balance that comes from being taken over by a sound; our aural back and forth with the world is gone and we are shaken into the larger vibrations." So what of my new zen approach to noise? Prochnik's book delves deeply into the extremes of noise and silence and everything in between - the Walkman, iPods, PA systems, urban pocket parks, sound designers, Deaf Architecture, boom cars, monks and more. "We probably do not need a pervasive silence - desirable as this might seem to some. What we do need is more spaces in which we can interrupt our general experience of noise. What we must aspire to is a greater proportion of quiet in the course of everyday life." Seeking out quiet as a respite, rather than the norm, has enough restorative power to effectively lessen the grating effects of a mostly noisy day. A hot bath and a good book; a walk in the bush; a few minutes spent looking at the clouds perhaps whilst wearing earmuffs (yes I have done this), could be just enough to give you some perspective and stillness, and ready you to walk back into your own noisy world with your soul ready to accept the noise you cannot fight, and the ability to let it wash gently through you without destroying your sense of calm and control.